A condom case that can blend in unnoticed in your purse? Yes! Every female should own one of these! This is a wonderful item for a sophisticated woman, college student, or high school girl. Safety and style are two things that transcend age, and the Just in Case II promises (and delivers) both! The only thing I dislike about this compact is it scratches fairly easily. Discreet, Cute, Average Compact Size, Great for Travel. I still like this compact, though technically I gifted it to a friend. I also own the Just in Case original, and I much prefer the design and color of that one to this one. 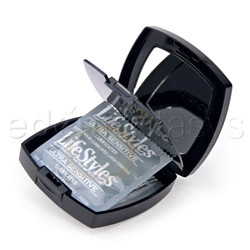 I knew my friend had been wanting one of these trendy little condom cases, so I offered it to her in slightly used, like-new condition. My friend loves it as much as I adore mine. Neither of us have yet used the condoms, but it's a comfort knowing they're there, just in case. These are really great and I love that they have a mirror. Thanks for the comparison between both products. Great review! I thought I might as well do a comparison, since I was lucky enough to have owned both products. Thanks for reading!